For over 10 years, Ana Cummings has designed and meticulously staged model homes for high profile Calgary builders and developers. Her private clients include busy professionals with families or the newly singled; vacation home, aviation and yacht owners; and empty nesters. She is available to work internationally, and is currently working with clients in the Caribbean. Ana integrates her client’s styles and incorporates existing furnishings into her designs. She is an expert in designing for condos and in producing unique, liveable and luxurious rooms. Ana skillfully translates vision into reality, and consistently delivers projects on time and on budget. Her beautiful designs leave her clients “unable to leave” the spaces she has created for them. Ana is a master of statement walls, from custom wall-coverings and specialty finishes to commissioned artworks and galleries. From the simplest colour consultation to the grandest kitchen redesign, Ana solves design challenges with original, stylish, budget and earth-friendly solutions. And if you are looking for technical innovations for your home Ana is an expert in motorized window coverings. Ana is a graduate of Mount Royal University, a member of the Calgary Design Group (CDG), Interior Décor Resources Canada (IDRC), and the Decorators and Designers Association of Canada (DDA) and President of the DDA Canada Alberta Chapter. She is committed to continuous learning and regularly attends design conferences to identify trends and examine the latest in home design. Ana is the only Decorators and Designers Association of Canada (DDA) and Interior Décor Resources Canada (IDRC) multiple award-winning show home designer in Calgary and has been flagged by Houzz as an “influencer”. 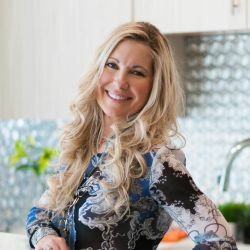 Her work can be found in Avenue Magazine, the Calgary Herald, Calgary Renovations Magazine, Calgary Condo Guide, Condo Living, Alaska Airlines Magazine, Houzz editorials worldwide, has appeared on Breakfast TV and is the design expert on CTV’s Homes and Lifestyles Canada. Ana can be found giving monthly workshops at retailers such as Urban Barn, playing badminton, practicing yoga, exploring new places and spaces around the globe, and raising her two boys.